A Democratic lawmaker is getting heavy blowback after he tried to shut down opposition to gun confiscation by reminding a critic that the government has nukes. Some took it as a bizarre threat to political dissent. Rep. Eric Swalwell (D-Calif.) confirmed that he was advocating for gun confiscation policies when he got into an odd tete-a-tete with a well-known right-wing critic of gun control. Dana Loesch laid out the lawmaker’s scheme in a tweet on Friday. “High ranking Democrat Eric Swalwell calls for confiscation of semi-automatic rifles using $15billion of taxpayer dollars to do it and proposes criminally prosecuting those who don’t participate,” she posted. Right-wing gun advocate Joe Biggs responded to the conversation, opining that gun confiscation would spark an insurrection among gun owners. “You’re outta your f**king mind if you think I’ll give up my rights and give the gov all the power,” he added. Swalwell’s bizarre reaction stunned many. “I’m sure if we talked we could find common ground to protect our families and communities,” he added oddly. Many took this statement as a threat that he wouldn’t be opposed to the government using nuclear weapons against U.S. citizens who were resisting gun confiscation. 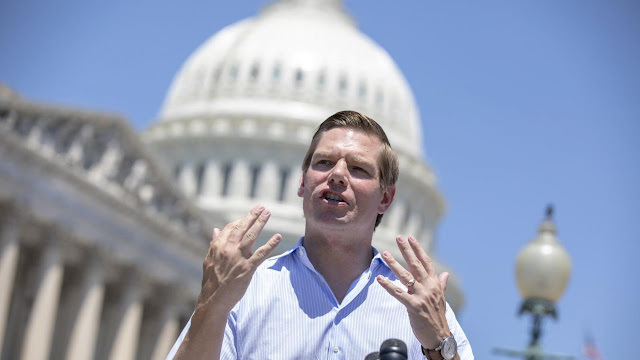 Swalwell denied that he was threatening a nuclear retaliation against U.S. citizens, saying that he was merely being sarcastic, and that the backlash was overly dramatic. Then he reiterated that the government would use overwhelming force to enforce gun control.